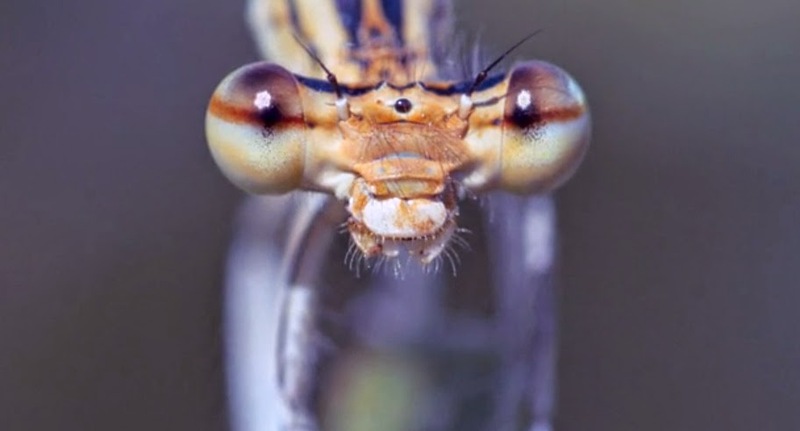 Get up close and personal with the damselfly, thanks to director Hasan Samur. Here he reveals that far from being identical, each damselfly has its own unique colorings and patterns – and they are striking to say the very least. Many carry the scars of battle – some blind, some missing legs. 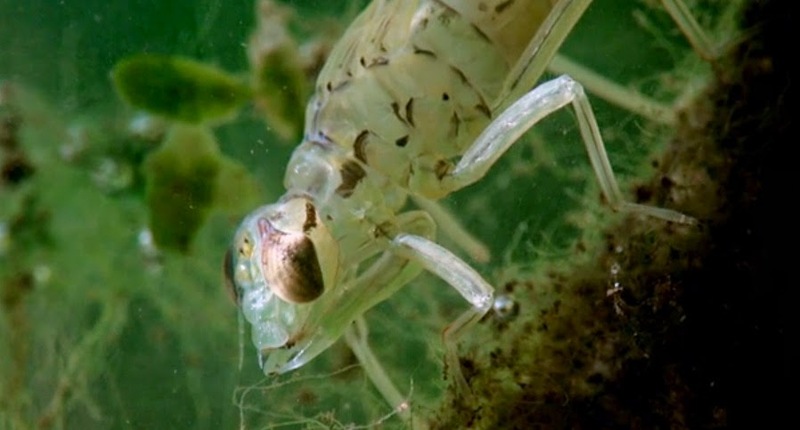 We also get to see some remarkable footage of damselflies mating which to our eyes may seem very strange behavior indeed. 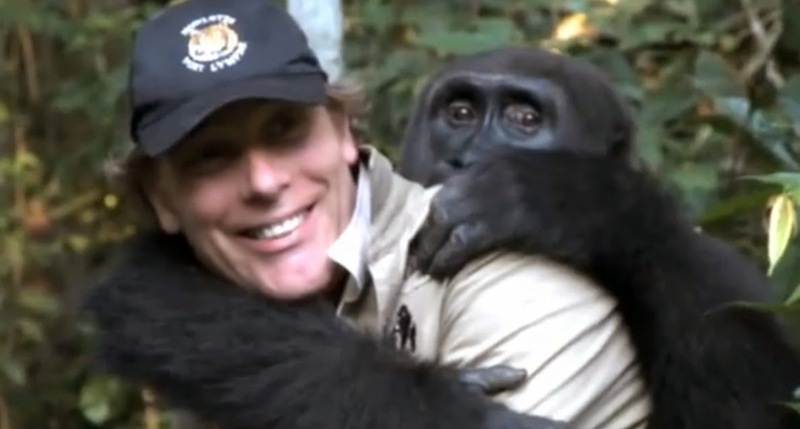 Andre Bauma works with orphaned gorillas in the Democratic Republic of Congo. Since the outbreak of civil war in 1996 the gorillas have been caught not in the mist but the crossfire. 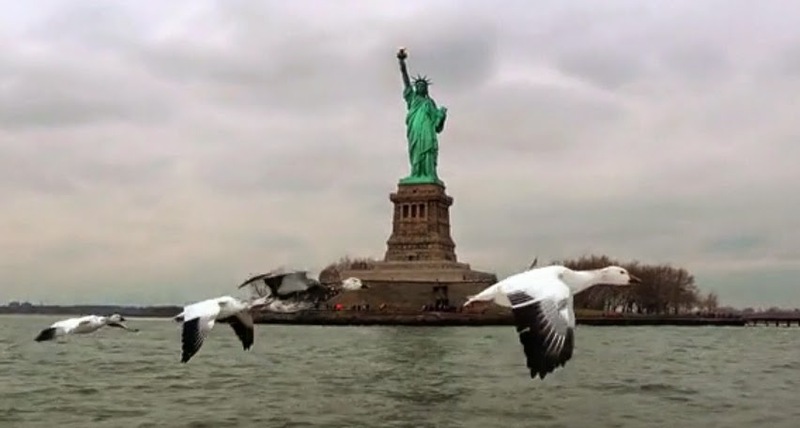 The human cost is also staggering with 150 park rangers murdered trying to protect them. 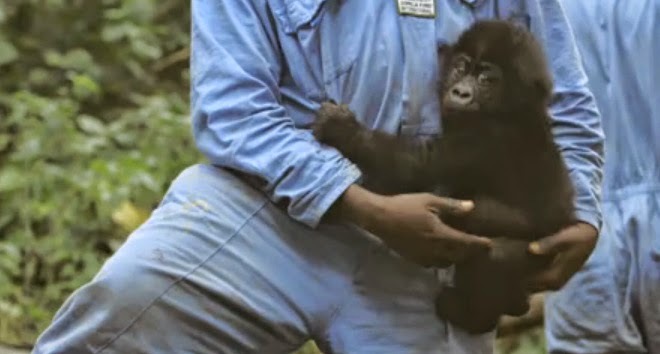 However, this vital job is carried on by a brave few as only about 800 gorillas survive in the wild. Created by Orlando Von Einsiedel of the New York Times, this moving video follows Andre and his group of orphans as they struggle through daily life in the Congo. If you don’t have nets to use then you can always make your own. 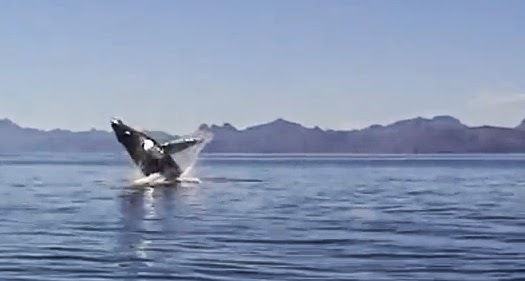 This is what humpback whales do when they sense an opportunity to enjoy a feast and this behavior is only seen in Southeast Alaska where this rare and remarkable footage was taken by AkXpro Productions. 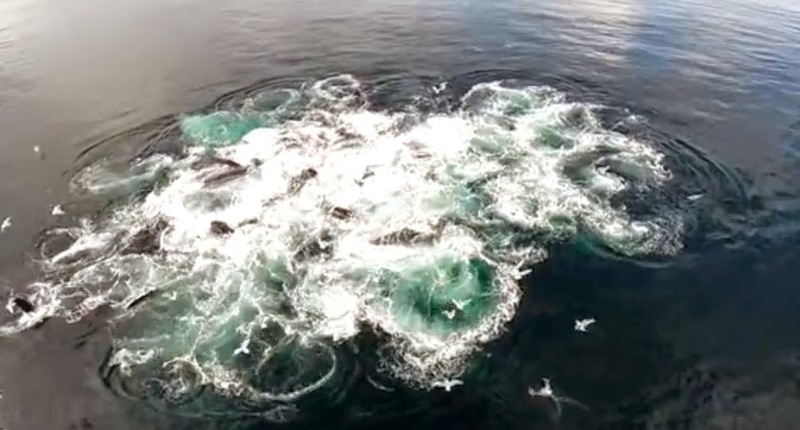 Other whales do use bubble feeding but this method is unique to the Alaskan whales. Anywhere from four to twenty whales will join in with the hunt. One will release a ring of bubbles from its blowhole beneath the herring. This curtain of bubbles acts as a wall which keeps the fish inside it. 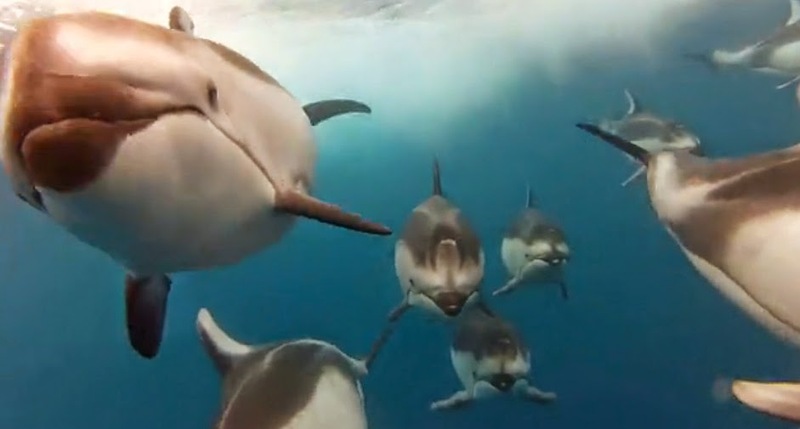 Then another whale will produce vocalizations (which we can’t hear in this video, of course!) which makes the herring squeeze together in tight balls. Then the whales lunge in unison. Breaking the surface simultaneously with their mouths wide open, then roll over and down. 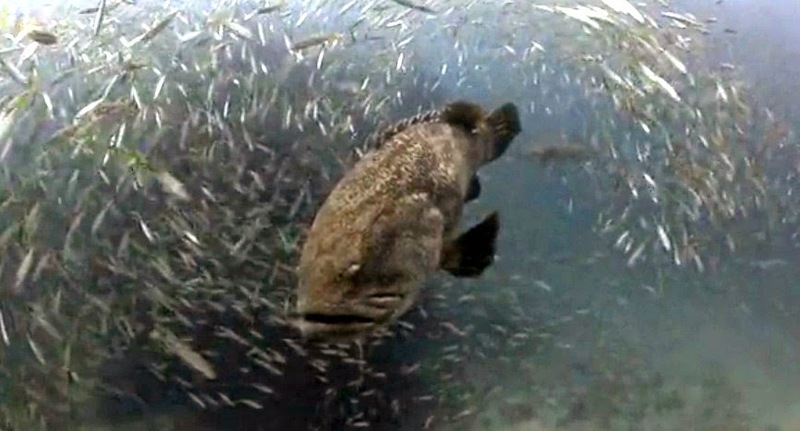 This captures as many fish as possible as well as forcing the water they take in out through their baleen plates. With the water forced out they can then gulp down their prey. Altogether, pretty amazing! 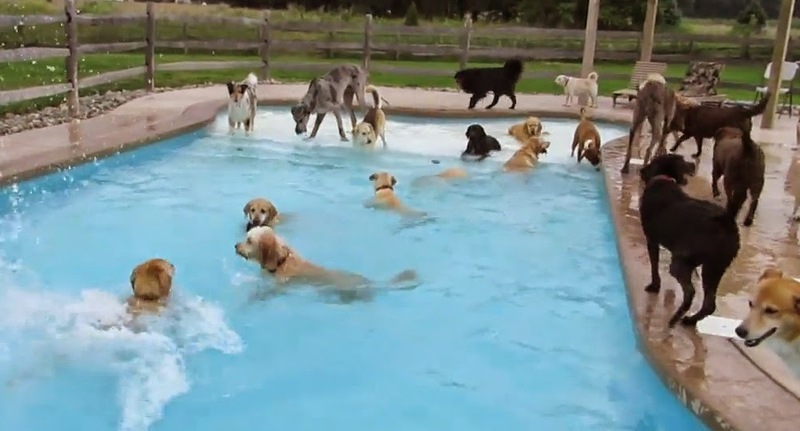 Dogs like nothing better than when something a little out of the ordinary happens. 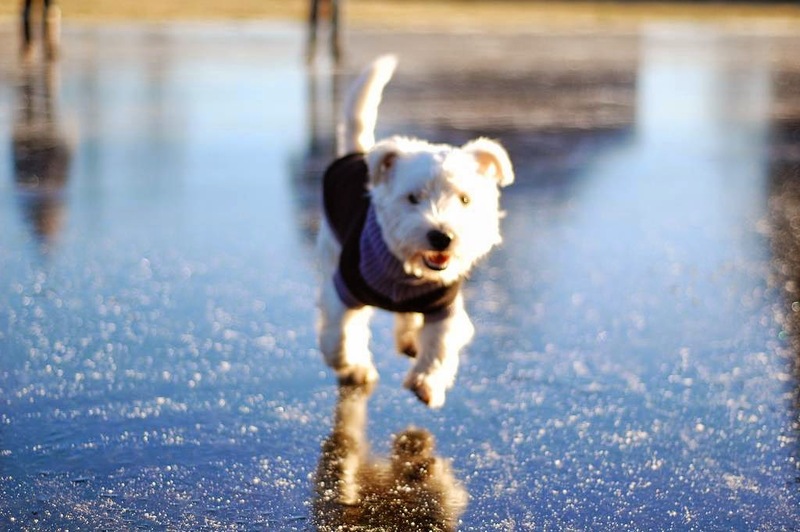 So, when the world has turned white one morning and the water has gone hard and slippery, you can’t blame a dog for getting a little excited, can you? 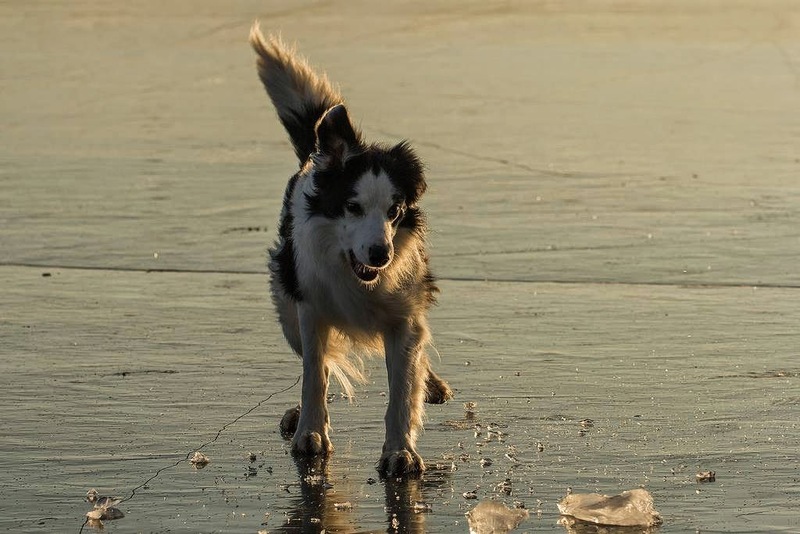 At first you might be a little unsteady on your paws but when there is a new and interesting experience to be had then a few slips and slides hardly matter. They are not exotic. They are hardly rare. 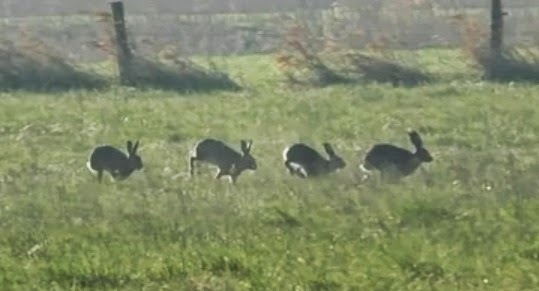 Yet there is no more joyous a sight than watching a group of hares bound around a field for no other reason, apparently, than they can and so, by heaven, they will. 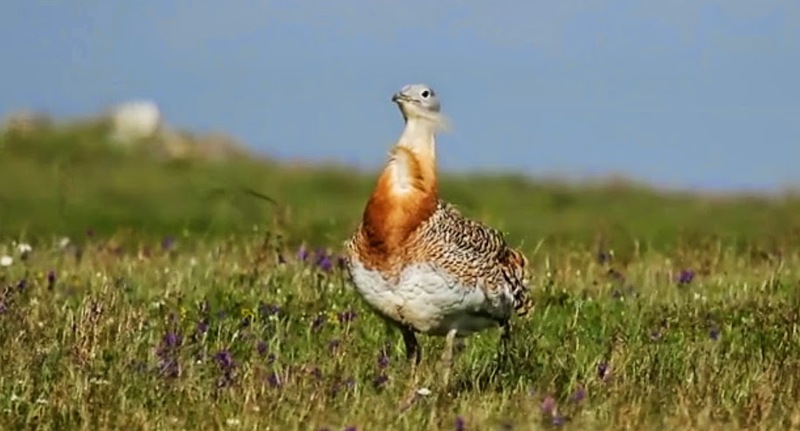 Watch this wonderful video by Ben and take in this jubilant exhibition. Yet, like the hare, don’t get too comfortable. Danger lurks around every corner. Mention the name Komodo and most people would associate it with the home of the largest lizard on the planet. Yet this fascinating and mysterious island has a reef, here captured by Dustin Adamson. 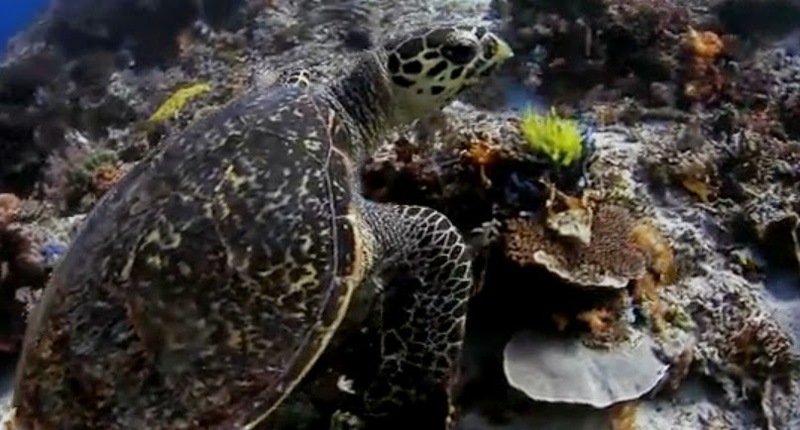 It is a place teeming with life and here the footage is shot wide so you can get a truly panoramic impression of this undersea universe. Go grab your beverage of choice, sit back, relax and let the beauty roll over you. 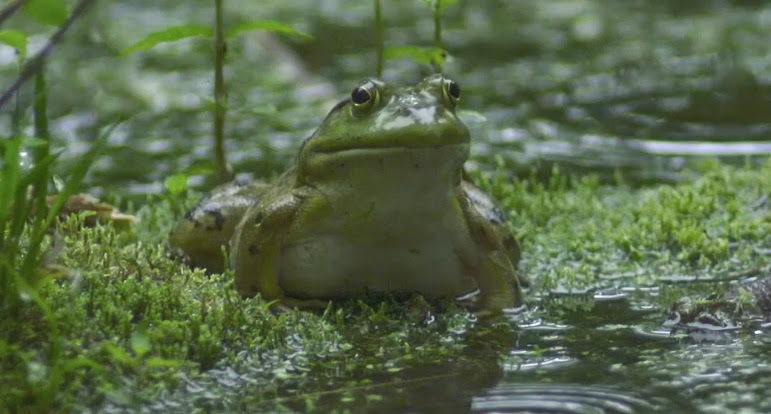 During a torrential downpour at Robert Frost Farm in the American state of New Hampshire, Michael N Sutton ventured into the forest which hides a frog pond and decided to film Bullfrogs in slowmo using his Photron Fastcam BC2 HD camera. Maybe not your average choice in a rainstorm but the result is mesmerizing. 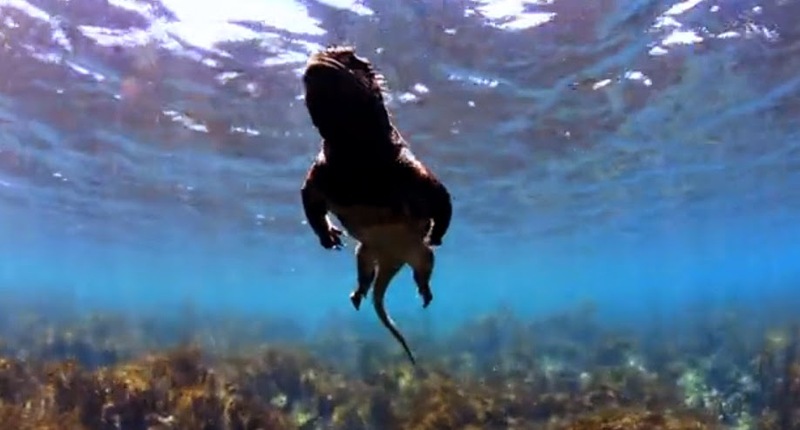 The footage captures the gymnastic prowess of the frogs perfectly. 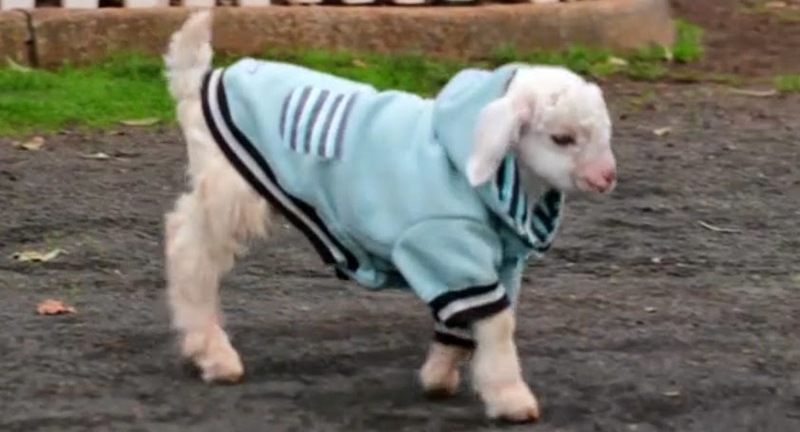 How is Frostie the Snow Goat Doing? 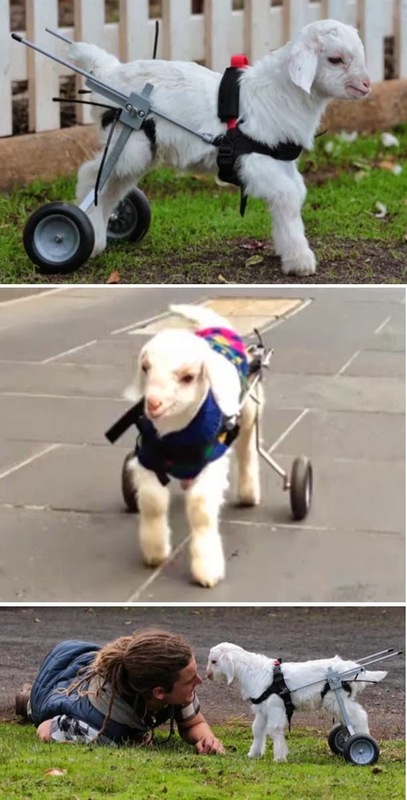 A month ago we shared the story of Frostie the Snow Goat with you. Among a number of general nasties that the kid was suffering from, he also had a condition called joint navel ill. This is an incredibly nasty infection which enters the body via the umbilical cord soon after birth. Frostie quickly took the internet by storm and captured the hearts of many. So, now, after a month it is time to ask how Frostie is doing. Has Frostie recovered? 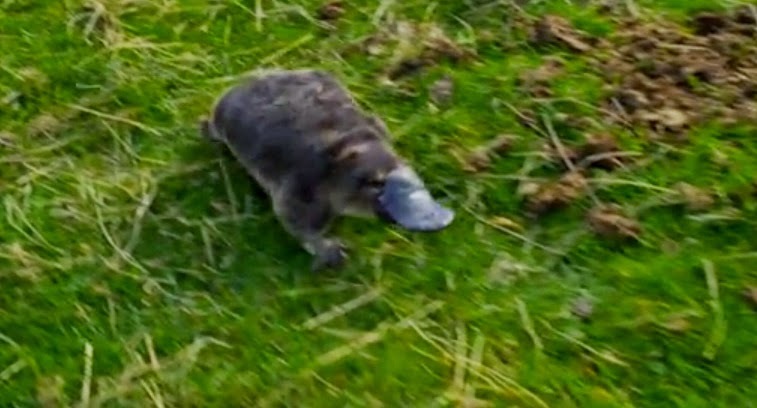 As you can see from the video above there is still some way to go but the sight of him gamboling around (a little totter here, a little totter there) is a joy to behold. 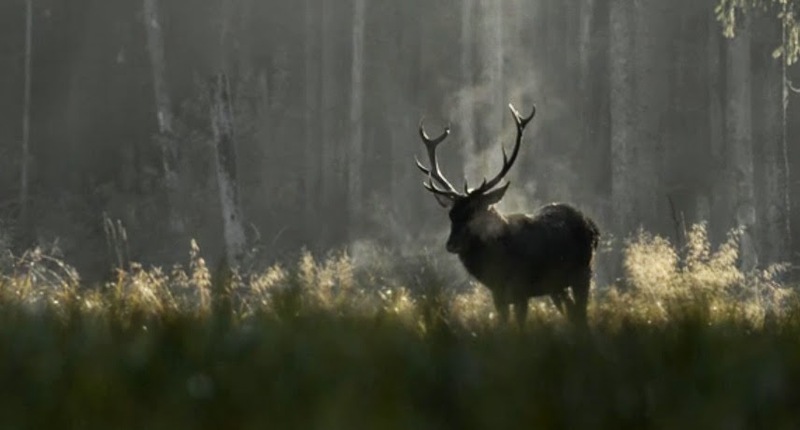 Do you see something a little strange about the deer in the picture? If your eyes were immediately drawn to those rather vampiric fangs protruding from its mouth, then your next thought might have been that this must be some sort of freak of nature, an accident of birth. That isn’t how deers come, is it? 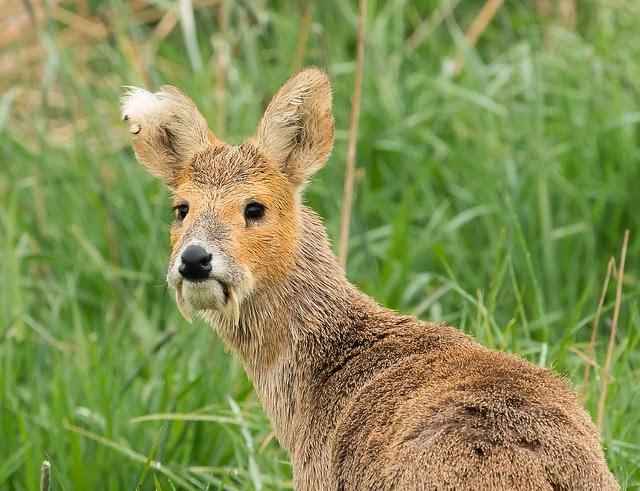 For the Water Deer, otherwise and popularly known as the Vampire Deer the answer is in the affirmative. Let’s give the animal its proper name. 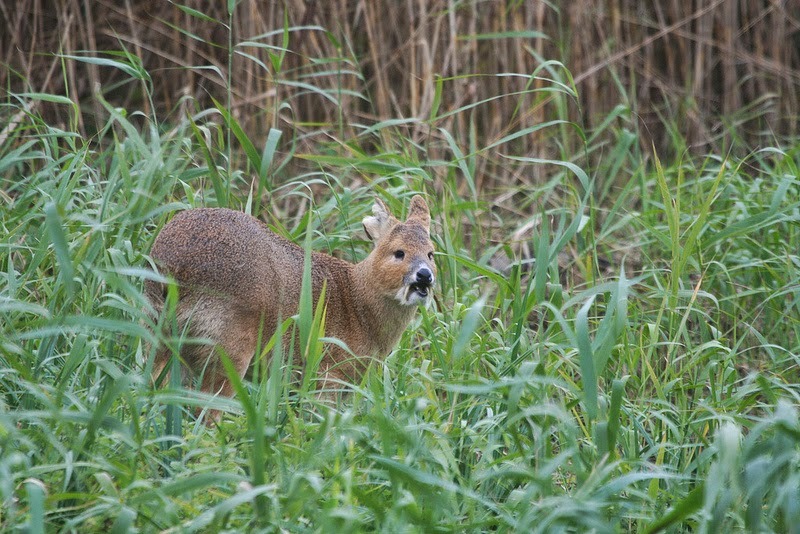 This is the Chinese Water Deer (Hydropotes inermis inermis) and it is one of two subspecies (the other being the Korean variety) which have prominent tusks, downward-pointing canine teeth which make it look as if it’s had a run in with a Nosferatu type who has suddenly acquired the ability to ‘turn’ mammals other than humans. This feature makes the subspecies unique – they are the only two members of the genus Hydropotes. I honestly didn’t think this was possible but here is the proof in front of my eyes – and this may well change the way that you look at sharks forever. 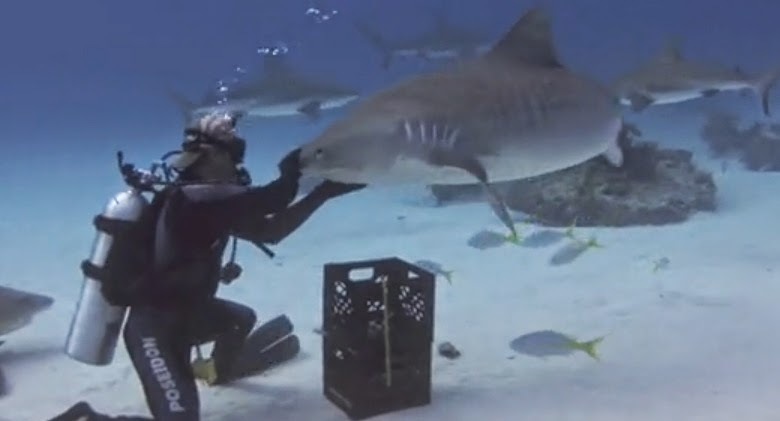 Diver Eli Martinez can be seen here diving with tiger sharks and interacting with them in what only can be described as a very friendly manner. He strokes and caresses the sharks, almost as if they were dogs they he is encountering at the local park in this video shot by Armando Gasse in the Bahamas. It is an amazing sight and something which probably confounds a lot of expectations about sharks in general. After all, thanks to a certain movie, many people believe that if you hold your hand out to a shark it will bite it off. Yet before you book your plane tickets and rent out the diving equipment, I should add one or two words. Martinez (who is also the editor of Shark Diver Magazine) has not simply jumped in to the ocean and struck up a friendship with some passing tiger sharks. He has known these individuals for years. It must be quite a thing to be able to say that you are first name terms with sharks. 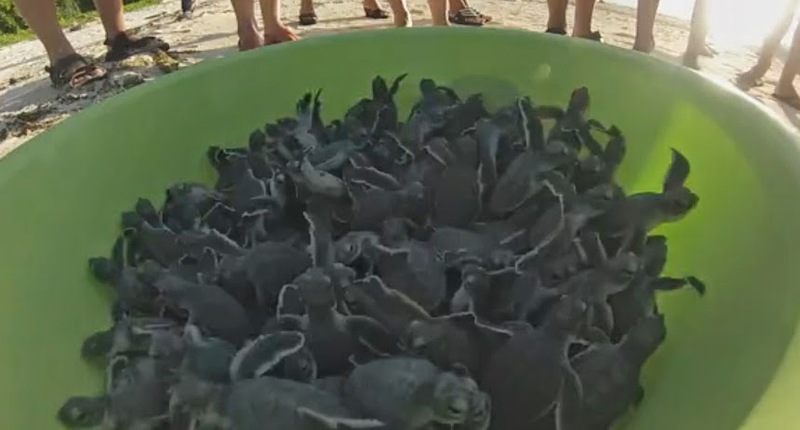 Below is another video of Mr Martinez on another one of his visits to Tiger Beach where he again gets to interact with a number of his friends. Among them are sharks he has named Taxi, Scratch, Cindy and Hook. They truly are ambassadors for their species. Frostie has been taking the internet by storm, to say the least. He was recently taken in by Edgar’s Mission a farm sanctuary in Willowmavin, Kilmore, in the state of Victoria, Australia. When young Frostie was taken in he had the worst case of lice that the folks at the farm have ever seen. He was severely dehydrated too. Yet these two conditions could be dealt with quite easily. Frostie also had something far more serious. He also had a condition called joint navel ill an incredibly nasty infection which enters the body via the umbilical cord soon after birth. The bacteria had spread through Frostie and had made its home in the joints of his hind limbs. This meant that the little guy could not work – and his body was full of horrible toxins. In order to flush them out he was pumped with antibiotics but a way had to be found to help the blood circulate. As you can see, necessity is the mother of invention and this remarkable wheeled contraption now helps the wheelie kid get about. He was soon ready for a big adventure! An important part of every dog’s training is learning how to wait. 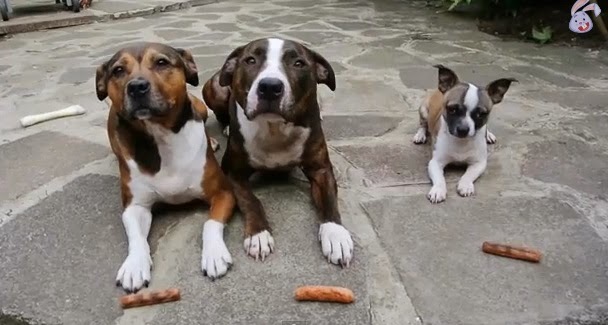 Here three dogs are being taught to wait until they are told they can have their treat – a cold sausage. The dogs patiently wait until permission is given – but what happens next will have you laughing out loud. Little Elmo, a Staffy and Chihuahua mix isn’t happy with his allotment. 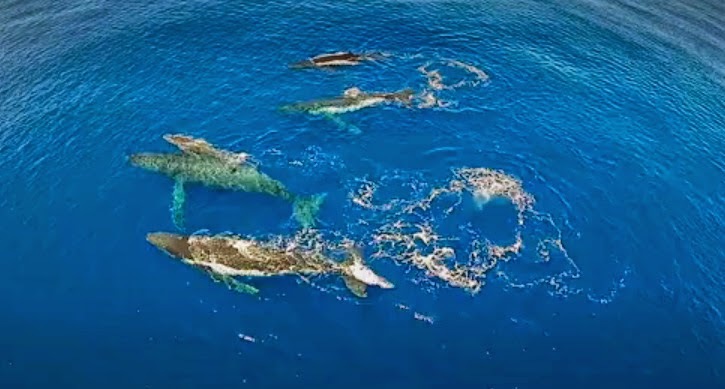 Michael Fishback and his family visit the Sea of Cortez, photographing whales to track them and observe their behaviors. However, on one of their trips they had the opportunity to help save a trapped humpback whale. 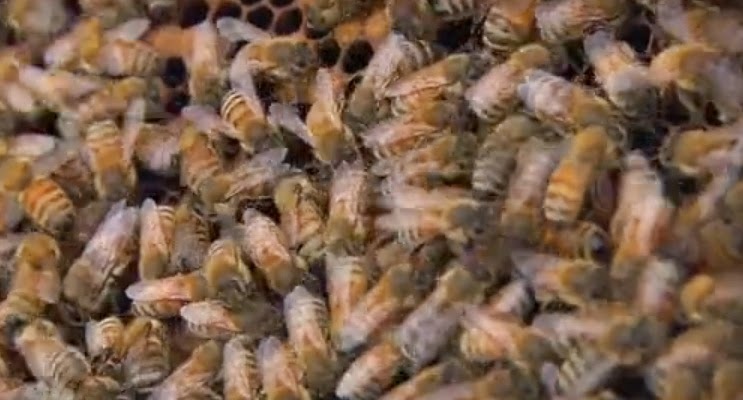 They took this incredible footage which shows you exactly what happened. The young whale at first appeared to be dead. The group floated next to it for a few minutes and saw no signs of life until it exhaled. Michael eased in to the water to assess the situation and found that the whale was terribly tangled in fishing net. Both pectoral fins were pinned to its body and it looked as if the whale would probably die unless something was done soon – and there was no time to waste. 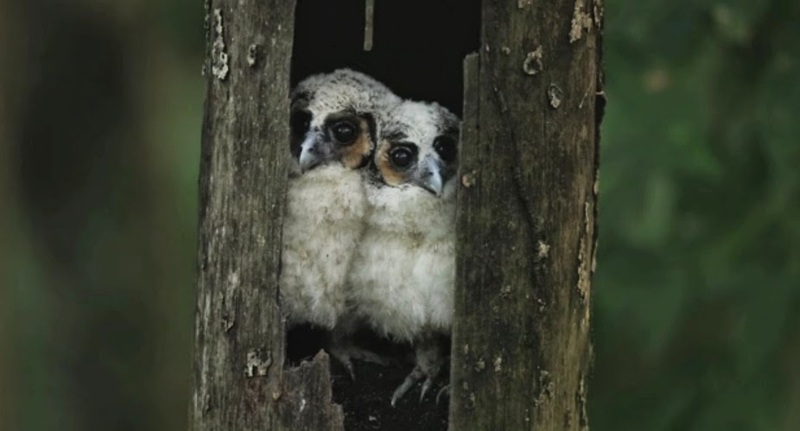 When you watch this amazing film you will see what happens next – and this time it is a happy ending. Once the whale is free though, it does something amazing – it shows its appreciation of the family and their endeavors to save him by giving them a show they will never forget. This isn’t a long video but we felt that we had to share. One little rabbit has a taste for raspberries so when he is presented with one he tucks right in. 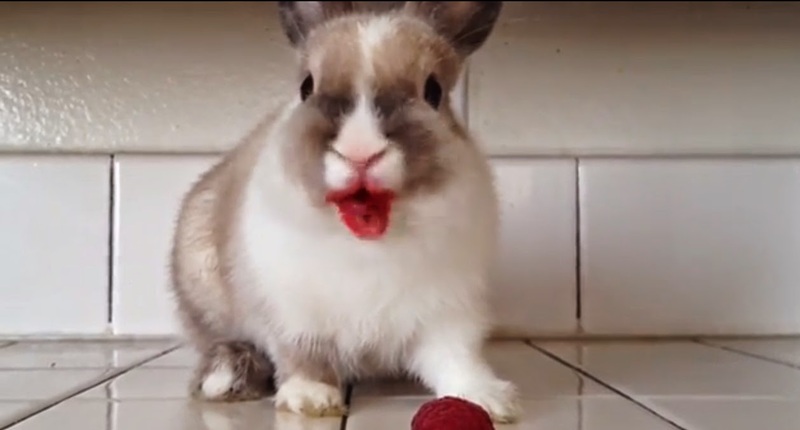 However, the juices flow and he ends up looking as if he is wearing lipstick – some kind of drag act bunny perhaps? This may only last about thirty seconds but we thought it might make it up to those of you who say that this site spends too long focusing on the grisly and the gruesome! When photographer Charlie Bird decided he wanted to photograph seal pups he decided to get as close up to them as possible. One of the elephant seal pups became rather inquisitive and before Charlie knew it he was getting more attention than he had bargained for. Not only that, one of the pups friend’s decides to join in too. 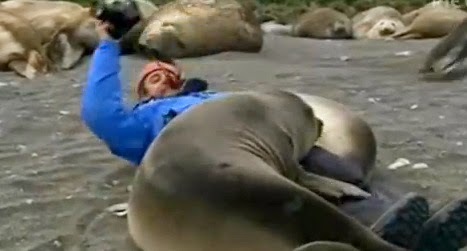 Good job for Charlie that it was just an elephant seal pup. If dad had decided to show interest too, he would have been in trouble. Southern elephant seal bulls typically reaching a length of 16 ft (4.9 m) and a weight of 6,600 lb (3,000 kg). Let’s face it, if you are as sharp and curious as the average goat then life in the farmyard could become just a little bit dull. However, when a flexible steel ribbon is placed inside your pen for no apparent reason then a use for it just has to be sound. 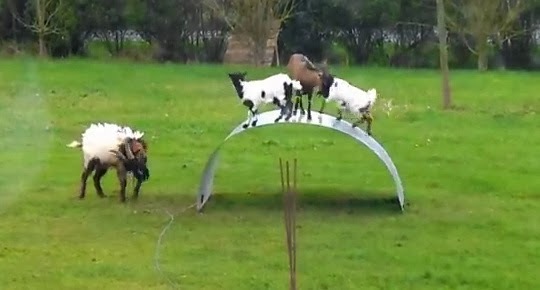 This video shows that just like most other living things on this wonderful planet of ours, goats just wanna have fun. The nudibranch is a group of soft-bodied, marine gastropod mollusks which shed their shell after their larval stage. 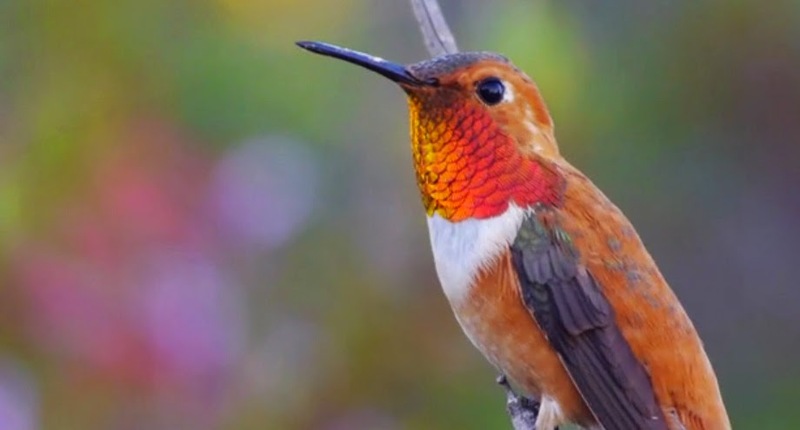 They have astonishing colors and striking forms. There are more than 3,000 described species of nudibranchs. 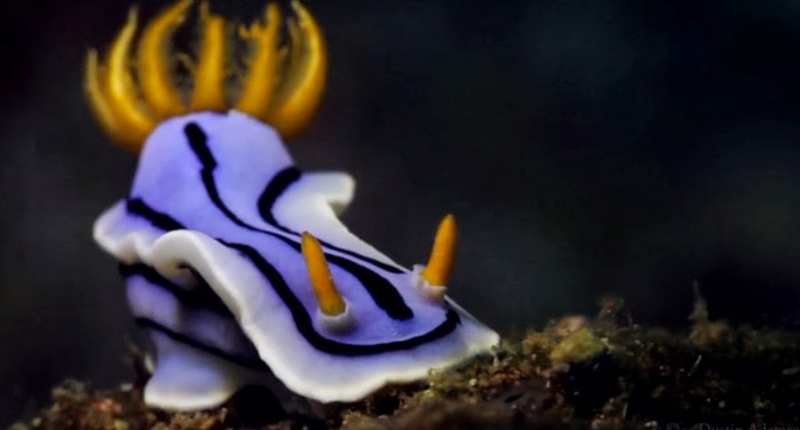 This short film by Dustin Adamson of Ocean Shutter focuses on the nudibranchs of Anilao in the Philippines. The close-up macro shots are simply stunning. Enjoy! This is Dawn – a rescued fox. She was very young when she was discovered by members of the public and they took her to a dog rescue center. By the time it was realised she was, in fact, a dog she had become too tame to be ever put back in the wild. 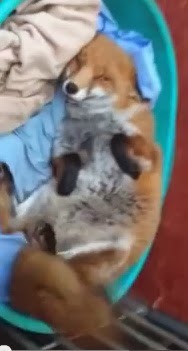 However, she was taken to the Nuneaton and Warwickshire Wildlife Sanctuary in the UK where she quickly made herself at home with the five other resident foxes there. 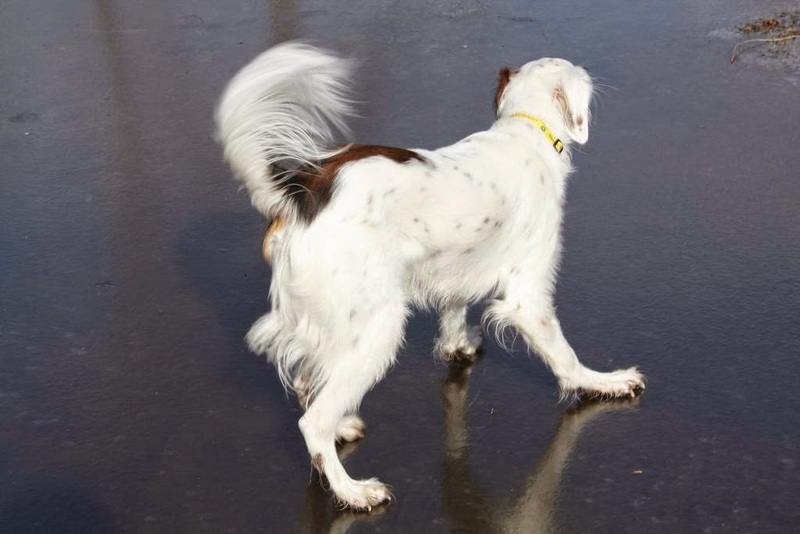 In this video one of her carers enters her enclosed area and the sounds of welcome – together with the amazing wagging of her bushy tail – are a joy to behold. 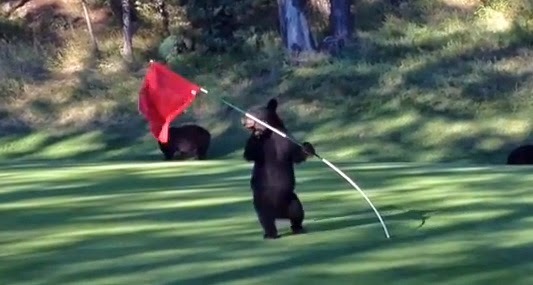 Despite the fact that the video is not high resolution this has gone viral. Yet we wouldn’t be a responsible site about animals if we didn’t slip in a quick statement. Foxes are not animals which can be domesticated – although they can bond with individuals they are way too volatile to be around strangers. In other words, pet foxes are pretty much a recipe for disaster. So, while Dawn is cute and adorable she would have had a much better life in the wild. Dogs like food – that’s a well-established fact. 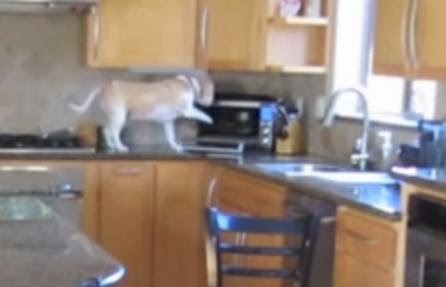 Some, however, are willing to go to great lengths to get to their between meal snack. Take Lucy for example. Her human, Rodd Scheinerman had caught her with her head in his oven on a previous occasion and decided to catch her red handed if she tried to do it again. He put some chicken nuggets in the oven and left the house. His cam secured in the kitchen area, this very funny piece of film was waiting for him on his return. Lucy had heard the oven alarm indicating that the chicken nuggets were ready. What she does next is ingenious, funny, charming and just a little bit naughty all at the same time! If you are a dog lover I am sure you will enjoy this home movie which no doubt will (like Lucy) be treasured for many years to come by Mr Scheinerman and his family.